The large open common room is used for eating and is great for relaxing in front of the nice warm stove burning coke that is included in the nightly rate. The room also includes the club's library which is available for all to use, but please don't remove any books. It's great for looking up everything from a walking route up Scafell, locating the classic Corvus climbing route in the next valley, or helping to identify the numerous birds that can be seen from the building. 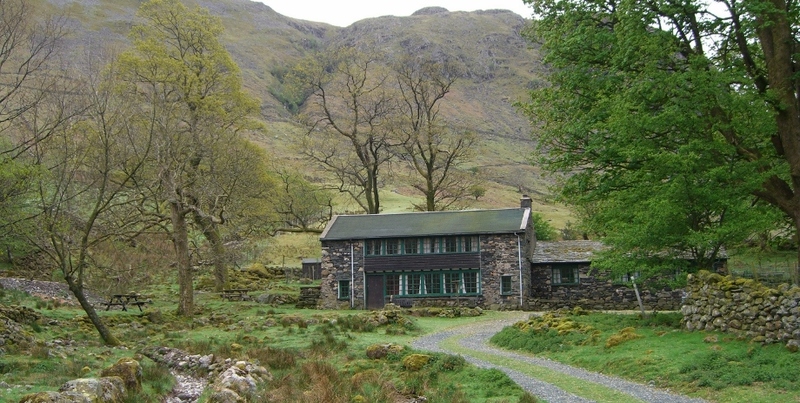 High House is fortunate to be situated in its own spacious grounds..
Having driven through the group of buildings making up the hamlet of Seathwaite, the final approach to High House is up a track through part of the grounds. There is a picnic table just outside the front door which is great for outdoor cups of tea or meals. Over the Runner is a slate bridge which leads you to the outdoor fire pit. Please feel free to have a fire in this, though you must provide your own wood. Opposite the front door is an area that was formerly an enclosure but is now known as 'the lawn' and where games of cricket are often held.